Look at that….a dry day at Burgess Hill test centre at the end of November! 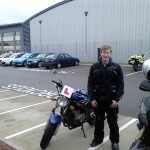 Well apart from the tears of joy from Josh who just passed his A2 motorcycle test with MTS Sussex! Everyone loves riding the Suzuki GS500’s for the a2 training so it’s good to see you standing proudly beside the one you passed your mod1 & mod2 bike tests on. Enjoy having a full motorbike licence, stay safe and no doubt we’ll see you about sometime soon.